The 1791 Gunleather RVH2 K-Frame Revolver Belt Holster, hand-crafted from our premium 100% Certified American, Heavy Native Steerhide leather, is thoughtfully designed to support K-Frame sized revolvers with barrels up to 6 inches in length. Show your Revolver some love with quality leather that offers excellent retention for comfortable and reliable all-day carrying. This OWB revolver belt holster is a perfect match for S&W 686, Ruger SP101s, and many other K-Frame size revolvers like the Ruger Vaquero®. Plus, with the many colors choices we offer the RVH2, you can find the best compliment for your revolver and best fit for your personal style. The first K-frame revolver was developed by Smith & Wesson in 1899. The “Military & Police” was a medium-sized revolver — slightly larger than the J-frame, but smaller than the L-frame. Its convenient size made it a decent service sidearm for people who frequently carry a revolver. Semi-automatics and J-frame wheel guns are popular today, but the reliable S&W Model 10 is still the top-selling revolver in history and a favorite among law enforcement personnel. The most common Smith & Wesson K-frame barrel length is a four-inch, but they’re also available as a two-inch “snub nose,” a 2.5-inch, a three-inch, and a longer six-inch. 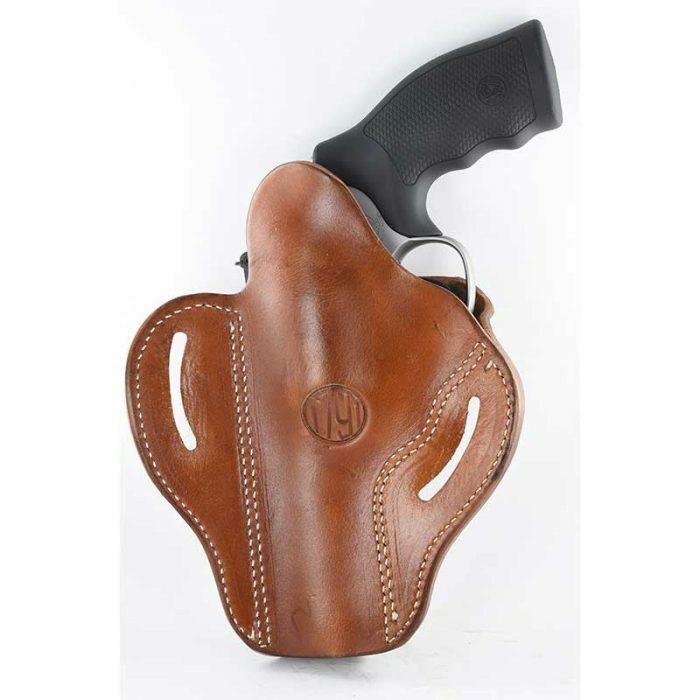 The snug, moldable leather of a 1791 Gunleather holster accommodates any size K-frame revolver you have after breaking it in for 24 hours with a freezer bag wrapped around your revolver. Secure – The reason you’re buying a holster is to securely retain your weapon when not in use. Our custom-molded revolver holsters snugly retain your weapon using heavy duty, double-reinforced-stitched leather and strong American steel clips beveled for comfort and safe retention. 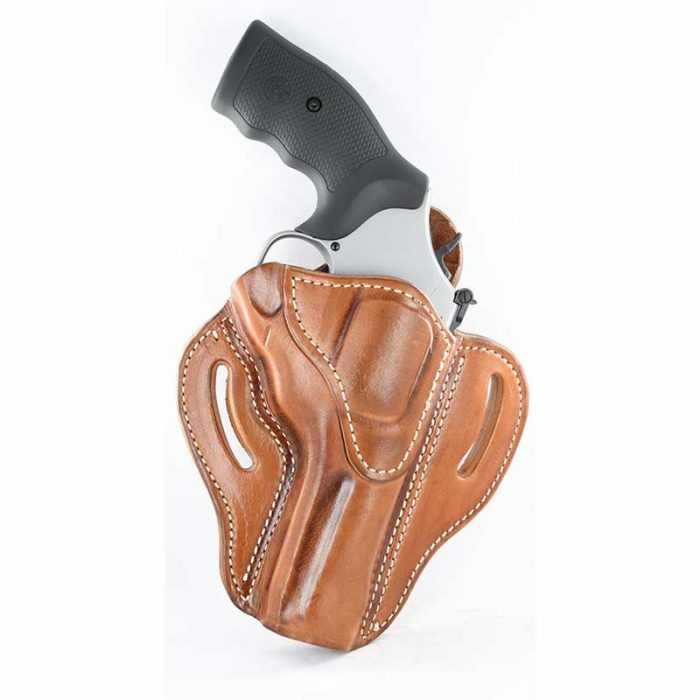 Comfortable – Some people may wear snub-nose revolvers in a pocket holster or IWB for a concealed carry, but the most popular type of holster for the longer barrel k-frames is the OWB belt holster we offer. It’s by far the most comfortable way to carry all day, either on your weak side or your strong side hip, depending on which type of draw you prefer. Durable – We only use leather from the highest quality American sources. Our heavy native steerhide is designed to last for generations. We stand by our craftsmanship with a Lifetime Warranty. Additionally, we care about protecting the bluing of your revolver with a close-bottom design and soft interior resistant to tarnishing or scratching. Accessibility — The RVH2 leaves the trigger easily accessible to you at all times, with NO added retention devices like thumb-breaks or trigger guard hoods. This is particularly important when using your weapon for personal protection or for frequent use on the range. 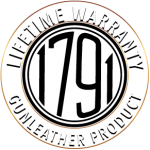 While there are many different brands offering k-frame revolver holsters, 1791 Gunleather products are among the very best. You can get a cheap piece of black nylon to hold your prized firearm, but why not treat yourself to a great-looking, great-smelling, comfortable leather holster that for proud upholding of Second Amendment rights? All our products are made from the highest quality American materials by fourth-generation leather artisans, with attention to detail without going overboard on frivolous embellishments. The convenient multi-fit design is able to accommodate a wide range of k-frame firearms, no matter the barrel size or manufacturer. We are happy to address any specific questions you have about our leather holsters before you buy. Got this to carry my 4” S&W M19. Was using another big-name holster that was just a tiny bit too short. As a result, the muzzle protruded ever so slightly and got damaged while driving my truck, it was rubbing the seat belt buckle. The 1791 holster fits much better and protects my gun. Plus it looks great and is really comfortable. 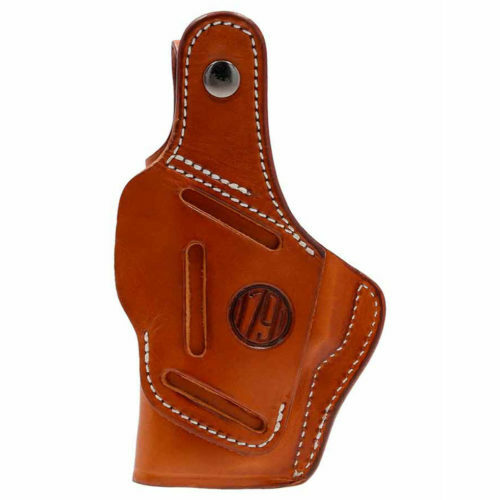 Like another reviewer, I purchased this holster for a S&W M19, mine with 3.5″ barrel. When I bought this revolver I could not find a holster at any local gun store or even big box sporting goods store. I ended up purchasing an expensive holster online, which took about 4 weeks to have made, and requires a retention strap. I am all about that retention strap when I am working on the farm or hiking, but I don’t care for it for everyday carry; I don’t play on the monkey bars much these days. In fact, the retention qualities of the 1791 holster are, hands down, the best of any open top holster I own. That is meaningful, I have spent a small fortune on gun leather over the years for both pistols and revolvers. The quality is at least as good as the big name holster makers, if not better. The leather seems to be much heavier duty than any of my other holsters and there is extra leather covering the cylinder. 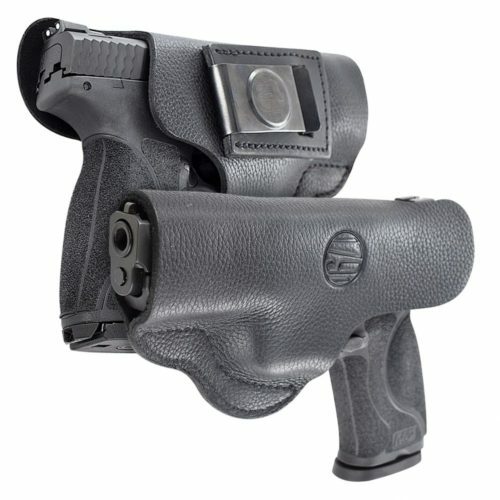 The holster has retained its shape and retention through sweat and wet, I see no reason that should change. In terms of aesthetics, the flat black matches my M19 finish and doesn’t show scuffs like a shiny holster does. The 1791 holster fits better than the custom made one I bought for about three times the cost of the 1791 model. Handguns are tools and tools must be carried to be available when needed and, by the same token, tools need to be protected from damage. This holster protects my M19 but it is still quickly accessible. The leather is cut high enough that when I crawled under my truck, the concrete scraped the leather but not my revolver. The other holster would not have prevented that. I like my tools to stay in good shape! 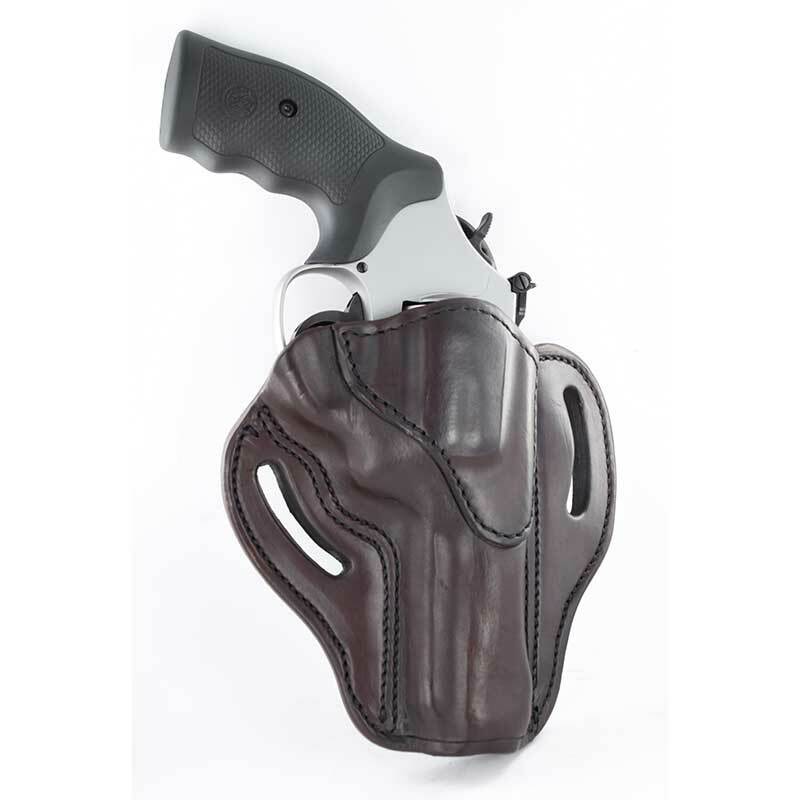 The 1791 holster is configured to carry the load of weapon such that it does not flop around, flop over, or dig into your love handles. I have had holsters that bounced around like Teddy Roosevelt’s 1892 Colt going up San Juan Hill. I’ve had others that had to be readjusted every few minutes if you were moving, which not only draws attention but is also annoying. Making carrying a large frame revolver comfortable is not easily achieved. I know that wheel guns have been passe since before I was even old enough to own a handgun, but they still have utility as well as cool points. 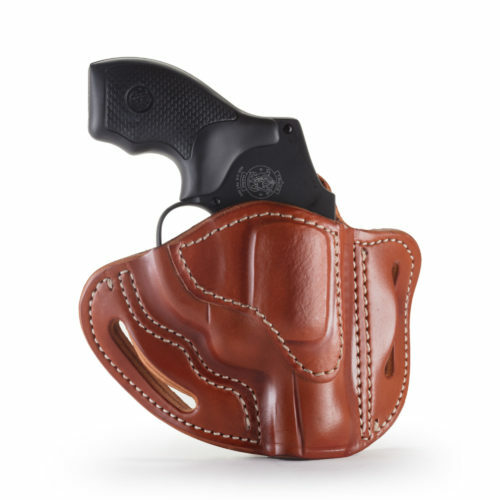 The fact that other holster makers don’t have an off the shelf model for popular revolvers like the M19 is a marketing mistake in my opinion. Of course, local gun stores need to carry them, but in my search, there were no revolver holsters in stock, save a few for J Frame / J Frame clones. I jokingly told the gun shop clerk I was buying this just to support 1791 and their decision to support my revolver habit. The fact that I can carry my GP100 or a single action I am fond of is just a bonus. I was a little bit leery of this brand because you generally get what you pay for, when you buy quality you only cry once. 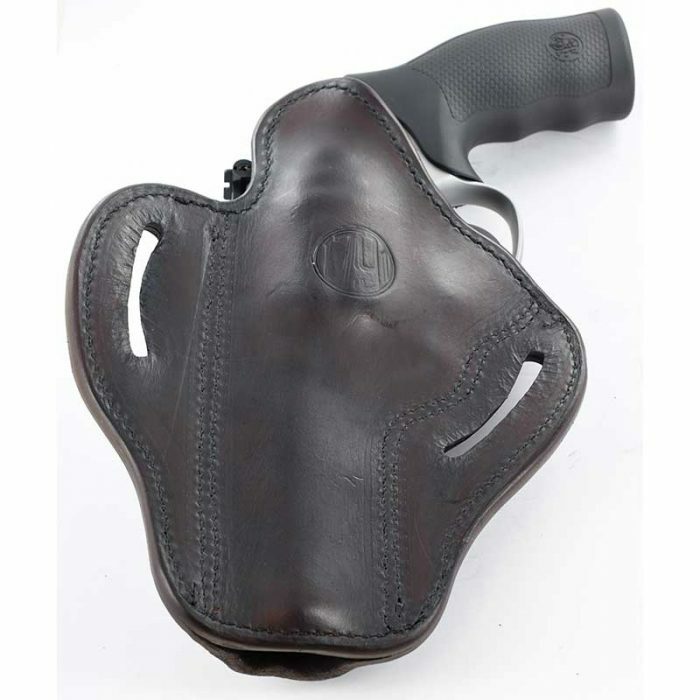 In this case, this holster is of the highest quality so there is no need to cry.